RIT physics professor Michael Richmond took a different route to work this summer. Instead of the familiar commute to campus and the RIT Observatory on John Street, he navigated the narrow mountain road to the Kiso Observatory in central Honshu, Japan. Richmond stayed for a month in Agematsu, the small town at the base of the mountain, during the second half of his fellowship with the Japanese Society for the Promotion of Science. 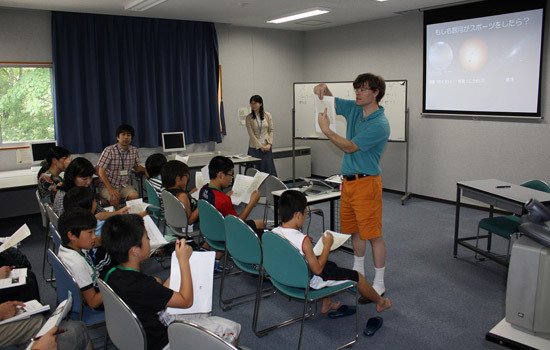 Before traveling to Agematsu, Richmond spent the first four weeks of his two-month fellowship working with students and professors at the University of Tokyo’s Institute of Astronomy in Mitaka, a suburb of the capital. His colleague Mamoru Doi, a professor at the institute and a collaborator, sponsored Richmond for the fellowship, his second extended research trip to Japan since 2008. The tragedy of the 8.9 magnitude earthquake, tsunami and nuclear meltdown on the east coast in March hung in the background of Richmond’s trip. He arrived in Japan for his two-month visit in June in the midst of a slow-moving recovery effort. Richmond notes, however, that the events had little impact on his time in Tokyo or at the Kiso Observatory. “This region [Nagano] has been spared most of the ills from the big earthquake and nuclear problems,” he says. Richmond concentrated on helping his Japanese colleagues write software to process raw images captured by the new Kiso Wide Field Camera on the observatory’s 1.05-meter Schmidt telescope. Large scans of the sky are maps to the universe. Astronomers use them to look for, among other things, bright super novae, or exploding stars, that act as markers for measuring distances to far away galaxies. Prior to joining RIT in 1997, Richmond wrote software to clean up raw data captured by the Sloan Digital Sky Survey, an ambitious effort that began mapping the sky with sensitive electronic detectors in the early 1990s. Conversing with his colleagues about science and software has been challenging for Richmond, whose grasp of conversational Japanese language—handy for ordering food and asking for directions—doesn’t include technical vocabulary.